20 turns of the pepper mill, or 1 tsp. 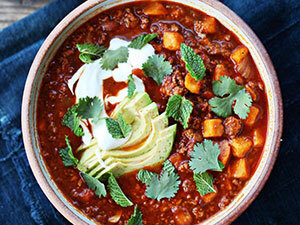 Chef Howard makes the most of a local crop in this recipe, where North Carolina-grown sweet potatoes stand in for beans and add a pleasing sweetness to an earthy, deceptively rich chili. Serve with sliced avocado, sour cream, tortilla chips or cilantro. In a 4-6 quart Dutch oven, brown the turkey meat in the olive oil over medium high heat. Remove the turkey with a slotted spoon and set aside. Lower the heat slightly and add the onions, garlic and 1/2 teaspoon salt. Sweat until the onions are translucent and add the spices. Toast, stirring frequently for about 1 minute. Stir in the tomato paste and the minced chipotle. Add the turkey back to the pot as well as the chicken stock. Bring it up to a simmer and add the sweet potatoes. Cover and cook at a brisk simmer for about an hour. Check the sweet potatoes periodically; you want them to crush easily under pressure from a wooden spoon, but not completely dissolve into the chili. Serve warm.